Deep Southern fried chicken and house-cured bacon spot. Thus concludes our virtual tour of the Mission. 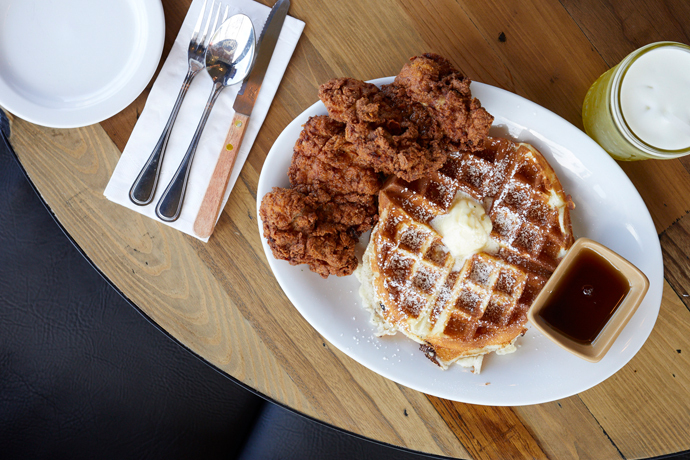 You’ll now get your fried fix at Buttermilk Southern Kitchen, a homey yet high-end Southern spot for fried chicken and mimosas, soft-opening tomorrow only and then officially opening Friday. Come with a date on a lazy Saturday and head outside to a sunny sidewalk table. Then just relax and let it all happen. They’ll bring out make-your-own mimosas, barrel-aged maple syrup for your pain perdu and housemade, well, basically everything—bacon, buttermilk, sweet tea—from the huge open kitchen. If you’ve got more of an evening-with-a-group-of-friends situation in mind, think seats at a banquette table under the slow fans and lanterns. Then: gumbo. Jambalaya. Carolina-style pulled pork. Louisiana-style brisket. Secret-recipe-style fried chicken. We think it’s got something to do with buttermilk.